6 Vintage Metal Ashtrays - Black Rod, Worthington, Bass, Players e.t.c. In fair condition, with obvious signs or age and wear. See Photo's for further condition report. This stamped steel ashtray say's: "Yuengling's Beer - Ale" on it with stamped lettering. Their brewery was located in Pottsville, PA. Just a Note ALL! pictures on All! 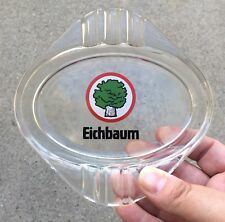 Eichbaum Beer Brewing Co. glass cigarette ashtray. A souvenir from the Eichbaum brewery in Mannheim, Germany. The condition of this can be seen in the photos. VINTAGE TEACHERS WHISKEY ASHTRAY, GREAT IN LOOKS AND CONDITION. VINTAGE TEACHERS WHISKEY ASHTRAY, GREAT IN LOOKS , OFF WHITE BODY, MUSTARD COURSE INTERIOR, IN ORIGINAL AND PERFECT CONDITION, 10 X 4.5 CMS. MAX., GILT BACK STAMP. OF THE PERIOD TO BASE? EMBOSSED IN GILT TEACHER, ESTAB. 1830, GILT RELIEF TO RIM, OFFERED WITH FREE ECONOMY UK POSTAGE. VINTAGE MOLSON'S PORTER ALE PORCELAIN ASHTRAY L@@K!!!! Material :Plastic Color :Random Size: Length*width=10*7.8cm/3.9*3.042inch Weight :53g Product cover and lower body color for random Mashup,Sometimes it's the same Note:It may have little color difference due to different monitor,which is normal,hope you can understand,any questions,just feel free to contact us,we will deal with it for you within 24 hours!. A RARE PIECE OF BREWERY ADVERTISING FOR A LONG DEFUNCT SMALL INDEPENDENT BREWERY FOUNDED IN 1846, BOUGHT BY WHITBREAD IN 1967 AND CLOSED IN 1972. IT IS 6" WIDE. Worthington Brewery. Ceramic Triangular Ashtray. G ood used condition as per scans. SCOTCH WHISKY. 1 WADE CERAMIC ASHTRAY. WHITE HORSE. OR FOR THE COLLECTOR. VERY GOOD CONDITION. SEE PHOTOS. This listing is for a really nice Vintage Beck's Bier Milk Glass Ashtray 7" - Becks Beer - Product of Germany. The ashtray was made in France by Opalex. It has some rough spots around the edges, some chips and others appear to be original production flaws. A fantastic addition to any collection or bar! 1 CERAMIC ASHTRAY. OR FOR THE COLLECTOR. TENNENT'S EXTRA. EXPORT LAGER. 1 CERAMIC ASHTRAY. OR FOR THE COLLECTOR. IN VERY GOOD CONDITION. 1 LARGE CERAMIC ASHTRAY. OR FOR THE COLLECTOR. GOOD CONDITION. SCOTCH WHISKY. 1 WADE CERAMIC ASHTRAY. HIGHLAND CREAM. (PHOTOS 3 - 6 SHOW ALL 4 SIDES). Here is a 4-1/2" in dia. It is in top unused condition. Neat old advertising ashtray for a German Brewery?. 1 CERAMIC ASHTRAY. OR FOR THE COLLECTOR. IN VERY GOOD CONDITION. LIGHT SURFACE SCRATCHES WHILST IN STORAGE. 1 CERAMIC ASHTRAY. OR FOR THE COLLECTOR. (POSSIBLY UNUSED BUT CAN'T BE SURE SO LISTED AS USED). Details As seen, shows normal wear. SOUVENIR from Monorail Safari Tour BUSCH GARDENS glass ASHTRAY TAMPA FLORIDA. Glass ASHTRAY. TAMPA FLORIDA. Ashbin Standard Dustbin . Smokers Ashbin. Any unauthorised use or disclosure may be unlawful. Pet Accessories. Luggage & Travel. Health & Beauty. Clothing & Accessories. Celebrations & Occasions. Photo shows the item you will receive. This is in good condition. It does have marks on the back see pictures. Front is in very nice condition. It is 9" round. Dunhill Ashtray. New & unused. IT IS 4 1/2" DIAM. An ashtray that was used.